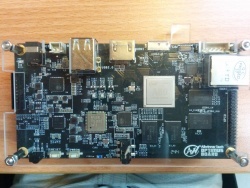 The A80 Optimus Board is a official development board for the Allwinner A80 SoC, targeting both developers and consumers. The board has a clearly recognizable Allwinner logo, the name "Allwinner Tech", and "OPTIMUS BOARD", all uppercase, in the lower right hand corner. Like all A80 based devices, there is no support in our sunxi kernel. Like all A80 based devices, there is no support in u-boot-sunxi. Mainline kernel support is queued up for 3.19. Currently only UARTs are supported. Use the sun9i-a80-optimus.dtb device-tree file for the mainline kernel. Like all A80 based devices, there is no support in mainline u-boot. Follow SDK build howto to build u-boot and the kernel from the SDK. Initial support for the A80 based on the A80 Optimus board is being worked on. There is no FEL mode button on this board. Instead you can enter fel mode from U-Boot. While U-Boot is starting, type CTRL+C to interrupt it. At the prompt type efex to enter fel mode. If booting fails entirely then FEL mode can be entered by shorting pin 29-30 on the nand/emmc with a suitable metal object (tweezer or the like), by vendor official procedure. The A80 Optimus board exposes a 2 mm pitch connector for GPIO, and a Camera/MIPI connector [connector details needed]. 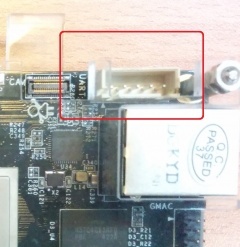 The board have a dedicated JTAG port with 2mm pinspacing. The UART header is next to the Ethernet port. The board comes with a custom USB UART cable that fits direclty into the header. Pcduino8 A80 Board: this board has a very similar layout and is probably closely related. Merrii provides firmware images for hardware owners, currently through their customer support. This page was last modified on 28 October 2016, at 06:44.